Where is Balaka Cinema hall ? Balaka cineplex is situated in New market area beside Neelkhat and Bakusha Books market. Bolaka cinema hall on the right side of Mirpur Road, if your go through Mirpur Road from Eden callege side or New market area. If you want to go Balaka just ask any Rickshow puller to carry you there or you can go to Balaka from anywhere by bus or CNG 3 wheeler. Balaka cineeplex movie shedule are 10:15am, 3:30pm, 6pm, 9:30pm in every day. Balaka cineworld also operate same movie schedule in Friday also. Balaka cimena hall in bd ticket available in the counter just before the movie start. You can take advance balaka movie ticket on regular price but you should contact 7 days the the movie show. There are 6 ticket counter in the ground floor of the Balaka cineworld building. If you want to watch any new film just go to balaka cine world to watch. Balaka cine world is one of the cineplex in BD which will be in the first row to bid for new film like Ak Cup Cha. Producer also prefer bolaka cinema hall to release film in any new film in Dhaka. There is no change in Balaka cinema hall movie schedule for new movie. But for new filem try to buy ticket before Balaka cineplex showtime. There are 2 halls inside the 3 storied building. Every hall seats capacity are 1265. On the ground floor there is a food corner and another one on the 1st floor. There is a authorized car parking back of the Balaka Cineword. People can park on the road also. Balaka Cinema Hall is a modern and air-condition cinema hall in Dhaka. Sound system and display system are equipped with modern technology. There is a waiting room for male and female in the gound flood and Toilet in every floor for male and female. Cinema Hall film show time : Most of the cinema halls in Bangladesh movie show time almost same. 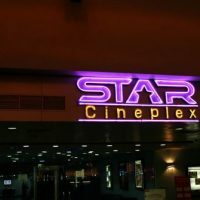 Normally Cinema movie show time in Dhaka and other cities at 12:00pm, 3:00pm, 6:00pm and 9:00pm. Asia Cinema Hall, Chayabani , Ananda , Nabin also show time start at 12:00pm, 3:00pm, 6:00pm, 9:00pm. Modhumita cinema hall is in Motijheel commercial area. Modhumita cinema hall is opposite of Dhaka Stock Exchange (DSE) building. You can go from Shapla Chattar to Modhumita Cinema Hall by Rickshaw at 10 taka only.